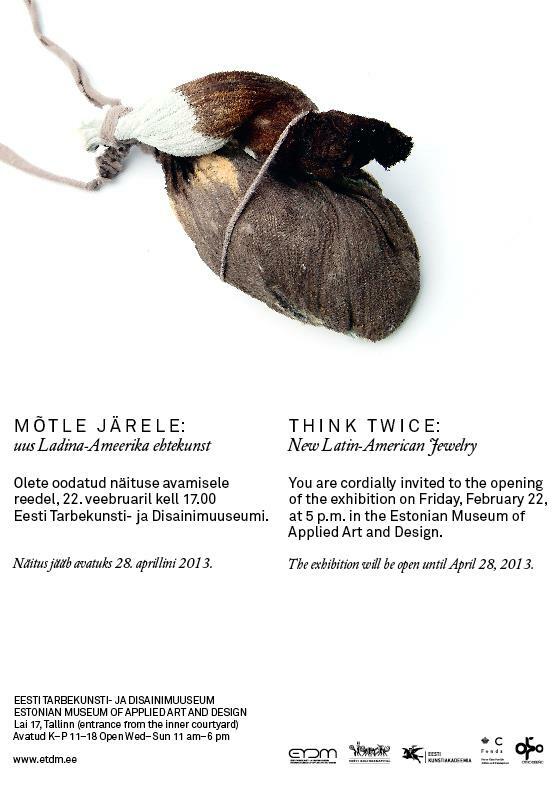 17:00 You are cordially invited to the opening of the exhibition Think Twice: New Latin American Jewellery at the Estonian Museum of Applied Arts and Design, next Friday 22nd February at 17:00The exhibition will be inaugurated by the Estonian Minister of Foreign Affairs, Mr. Urmas Paet. The programme is compiled and executed in collaboration with Otro Diseno Foundation, The Estonian Museum of Applied Art and Design, The Estonian Academy of Art and Hop Gallery. Otro Diseno Foundation , Prince Claus Foundation, The Estonian Museum of Applied Art and Design, Estonian Cultural Endowment, The Estonian Academy of Art, Hop Gallery.